This article is about the neolithic site in Jordan. For the depopulated Palestinian village, see Ayn Ghazal. Ayn Ghazal ('Ain Ghazal, ʿayn ġazāl عين غزال ) is a neolithic archaeological site located in metropolitan Amman, Jordan, about 2 km north-west of Amman Civil Airport. Area of the fertile crescent, circa 7500 BC, with main sites. 'Ain Ghazal is one of the important sites of the Pre-Pottery Neolithic period. The area of Mesopotamia proper was not yet settled by humans. The settlement at 'Ain Ghazal ("Spring of the Gazelle") first appeared in the Middle Pre-Pottery Neolithic B (MPPNB ) and is split into two phases. Phase I starts circa 10,300 BP and ends c. 9,950 BP, while phase II ends c. 9,550 BP. The 9th millennium MPPNB period in the Levant represented a major transformation in prehistoric lifeways from small bands of mobile hunter–gatherers to large settled farming and herding villages in the Mediterranean zone, the process having been initiated some 2–3 millennia earlier. In its prime era circa 7000 BCE, the site extended over 10–15 hectares (25–37 ac) and was inhabited by ca. 3000 people (four to five times the population of contemporary Jericho). After 6500 BC, however, the population dropped sharply to about one sixth within only a few generations, probably due to environmental degradation, the 8.2 kilo-year event (Köhler-Rollefson 1992). It is situated in a relatively rich environmental setting immediately adjacent to the Zarqa River (Wadi Zarqa), the longest drainage system in highland Jordan. It is located at an elevation of about 720m within the ecotone between the oak-park woodland to the west and the open steppe-desert to the east. `Ain Ghazal started as a typical aceramic, Neolithic village of modest size. It was set on terraced ground in a valley-side, and was built with rectangular mud-brick houses that accommodated a square main room and a smaller anteroom. Walls were plastered with mud on the outside, and with lime plaster inside that was renewed every few years. Evidence recovered from the excavations suggests that much of the surrounding countryside was forested and offered the inhabitants a wide variety of economic resources. Arable land is plentiful within the site's immediate environs. These variables are atypical of many major neolithic sites in the Near East, several of which are located in marginal environments. Yet despite its apparent richness, the area of 'Ain Ghazal is climatically and environmentally sensitive because of its proximity throughout the Holocene to the fluctuating steppe-forest border. In 'Ain Ghazal, the early Pottery Neolithic period starts c. 6,400 BC, and continues to 5,000 BC. 'Ain Ghazal Statues: closeup of one of the bicephalous statues, c.7000 BC. As an early farming community, the `Ain Ghazal people cultivated cereals (barley and ancient species of wheat), legumes (peas, beans and lentils) and chickpeas in fields above the village, and herded domesticated goats. In addition they hunted wild animals – deer, gazelle, equids, pigs and smaller mammals such as fox or hare. The estimated population of the MPPNB site from ‘Ain Ghazal is of 259-1349 individuals with an area of 3.01-4.7 ha. Is argued that at its founding at the commencement of the MPPNB ‘Ain Ghazal was likely about 2 ha in size and grew to 5 ha by the end of the MPPNB. At this point in time their estimated population was 600-750 people or 125-150 people per hectare. The diet of the occupants of PPNB 'Ain Ghazal was remarkably varied. Domesticated plants included wheat and barley species, but legumes (primarily lentils and peas) appear to have been preferred cultigens. A wide suite of wild plants also were consumed. The determination of domesticated animals, sensu stricto, is a topic of much debate. At PPNB 'Ain Ghazal goats were a major species, and they were used in a domestic sense, although they may not have been morphologically domestic. Many of the phalanges recovered exhibit pathologies that are suggestive of tethering. An impressive range of wild animal species also were consumed at the site. Over 50 taxa have been identified, including gazelle, Bos, Sus sp., Lepus, and Vulpes. ‘Ain Ghazal was in an area that was suitable for agriculture and then grew as a result of the same dynamic. Archaeologists think that throughout the mid east much of the land was exhausted after some 700 years of planting and so became unsuitable for agriculture. The people from those small villages abandoned their unproductive fields and migrated, with their domestic animals, to places with better ecological conditions, like ‘Ain Ghazal that could support larger populations. As opposed to other sites as new people migrated to ‘Ain Ghazal, probably with few possessions and possibly starving, class distinctions began to develop. The influx of new people placed stresses on the social fabric – new diseases, more people to feed from what was planted and more animals that needed grazing. There are evidences of mining activities as part of a production sequence conducted by craftspersons at the site of ‘Ain Ghazal, these potential part-time specialists in some way controlled access to such raw materials. One of the `Ain Ghazal Statues. Y-DNA haplogroup E1b1b1b2 has been found in 75% of the 'Ain Ghazal population, along with 60% of PPNB populations (and is present in all three stages of PPNB) and in most Natufians. T1a (T-M70) is found among the later Middle Pre-Pottery Neolithic B (MPPNB) inhabitants from 'Ain Ghazal, but was not found among the early and middle MPPNB populations. As was previously found in the early Neolithic settlement from Karsdorf (Germany) a subclade of mtDNA R0 was found with Y-DNA T at 'Ain Ghazal. It is thought, therefore, that the Pre-Pottery Neolithic B population is mostly composed of two different populations: members of early Natufian civilisation and a population resulting from immigration from the north, i.e. north-eastern Anatolia. In the earlier levels at ‘Ain Ghazhal there are small ceramic figures that seem to have been used as personal or familial ritual figures. There are figurines of both animals and people. The animal figures are of horned animals and the front part of the animal is the most clearly modeled. They all give the impression of dynamic force. Some of the animal figures have been stabbed in their vital parts these figures have then been buried in the houses. Other figurines were burned and then discarded with the rest of the fire. They built ritual buildings and used large figurines or statues. The actual building of them is also a way for an elite group to demonstrate and reify its authority over those who owe the community or the elite labor as service and to bond laborers together as part of a new community. In addition to the monumental statues small, clay and stone tokens, some with incised with geometric or naturalistic shapes were found at ‘Ain Ghazal. The 195 figurines (40 human and 155 animal) recovered were from MPPNB contexts; 81% of the figurines have been found to belong to the MPPNB while only 19% belonging to the LPPNB and PPNC. The vast majority of figurines are of cattle. A species that makes up only 8% of the overall number of identified specimens (NISP) count. The importance of hunted cattle to the domestic ritual sphere of ‘Ain Ghazal is telling. It was seemingly of importance for individual households to have members who participated both the hunting of cattle – likely a group activity – and the subsequent feasting on the remains. `Ain Ghazal is renowned for a set of anthropomorphic statues found buried in pits in the vicinity of some special buildings that may have had ritual functions. These statues are half-size human figures modeled in white plaster around a core of bundled twigs. The figures have painted clothes, hair, and in some cases, ornamental tattoos or body paint. The eyes are created using cowrie shells with a bitumen pupil and dioptase highlighting. In all, 32 of those plaster figures were found in two caches, 15 of them full figures, 15 busts, and 2 fragmentary heads. Three of the busts were two-headed. Considerable evidence for mortuary practices during the PPNB period have been described in recent years. Post-mortem skull removal, commonly restricted to the cranium, but on occasion including the mandible, and apparently following preliminary primary interments of the complete corpse. Such treatment has commonly been interpreted as representing rituals connected with veneration of the dead or some form of "ancestor worship". There is evidence of class in the way the dead are treated. Some people are buried in the floors of their houses as they would be at other Neolithic sites. After the flesh had wasted away some of the skulls were disinterred and decorated. This was either a form of respect or so that they could impart their power to the house and the people in it. However, unlike other Neolithic sites, some people were thrown on trash heaps and their bodies remain intact. Scholars have estimated that a third of adult burials were found in trash pits with their heads intact. They may have seen the newcomers as a lower class. `Ain Ghazal people buried some of their dead beneath the floors of their houses, others outside in the surrounding terrain. Of those buried inside, often the head was later retrieved and the skull buried in a separate shallow pit beneath the house floor. Also, many human remains have been found in what appear to be garbage pits where domestic waste was disposed, indicating that not every deceased was ceremoniously put to rest. Why only a small, selected portion of the inhabitants were properly buried and the majority simply disposed of remains unresolved. Burials seem to have taken place approximately every 15–20 years, indicating a rate of one burial per generation, though gender and age were not constant in this practice. The site is located at the boundary between Amman's Tariq and Basman districts, next to, and named for, the Ayn Ghazal Interchange connecting Al-Shahid Street and Army Street (Ayn Ghazal is the name of a minor village just north of the road, now within Tariq district). The site was discovered in 1974 by developers who were building Army St, the road connecting Amman and Zarqa.. Excavation began in 1982, however by this time, around 600 meters (1,970 ft) of road ran through the site. Despite the damage urban expansion brought, what remained of `Ain Ghazal provided a wealth of information and continued to do so until 1989. One of the more notable archaeological finds during these first excavations came to light in 1983. While examining a cross section of earth in a path carved out by a bulldozer, archaeologists came across the edge of a large pit 2.5 meters (8 ft) under the surface containing plaster statues. Another set of excavations, under the direction of Gary O. Rollefson and Zeidan Kafafi took place in the early 1990s. The site was included in the 2004 World Monuments Watch by the World Monuments Fund to call attention to the threat of encroaching urban development. ^ Graeme Barker; Candice Goucher (16 April 2015). The Cambridge World History: Volume 2, A World with Agriculture, 12,000 BCE–500 CE. Cambridge University Press. pp. 426–. ISBN 978-1-316-29778-0. ^ Simmons, Alan H.; et al. (2014). "'Ain Ghazal: A Major Neolithic Settlement in Central Jordan". American Association for the Advancement of Science. ^ Rollefson, G.; et al. (1992). 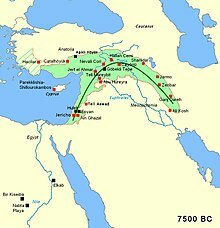 "Early Neolithic exploitation patterns in the Levant: cultural impact on the environment". Population and Environment. ^ Rollefson, G. O.; et al. (1998). "Invoking the Spirit Prehistoric religion at Ain Ghazal". Archaeology Odyssey. ^ a b c d Kleiner, Fred S.; Mamiya, Christin J. (2006). Gardner's Art Through the Ages: The Western Perspective: Volume 1 (Twelfth ed.). Belmont, California: Wadsworth Publishing. pp. 11–2. ISBN 0-495-00479-0. ^ Goren, Yuval; et al. (2001). "The Technology of Skull Modelling in the Pre-Pottery Neolithic B (PPNB): Regional Variability, the Relation of Technology and Iconography and their Archaeological Implications". Journal of Archaeological Science. doi:10.1006/jasc.1999.0573. Wikimedia Commons has media related to Ain Ghazal. Scarre, Chris, ed. (2005). The Human Past. Thames & Hudson. p. 222.